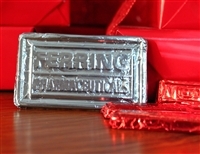 Company logos and designs look and TASTE great made with our creamy, Swiss-style milk chocolate! This is custom work and has some lead time involved since there is a three step process. First, we have a mold made using your art work. Next, we make the chocolates, and then- we package them up as you desire. They can be boxed, wrapped in cellophane or colored foil or they can go into an assortment with other chocolates, or even a gift basket. The whole process is anywhere from 2 weeks to a month so don't delay! Custom Mold Fee- Small mold 1-3 oz.